We store personal information for only as long as we have a reason to keep it (sending newsletters and emails for example). We have tops notch security set in place within WordPress to protect any and all information you give us. Personally Identifiable Information refers to information that tells us specifically who you are, such as your name, email address, or mailing address (mailing address only required when purchase is made). Downloading information or logging in may allow the Company to “recognize” you to allow us to personalize our service for you. For our Clients, we use personal information mainly to provide the Services and contact our Clients regarding account activities, new version and product offerings, or other communications relevant to the Services. We do not sell or share any personally identifiable or other information of End Users to any third parties, except, as mentioned above. Communications With Us: You may also provide us information when you respond to surveys. Information that you choose to make public is–disclosed publicly. That means, of course, that information like your public profile, posts, other content that you make public on your website, and your “Likes” and comments on other websites, are all available to others! For example, the photo that you upload to your public profile, or a default image if you haven’t uploaded one, is your Globally Recognized Avatar, or Gravatar–get it? :). Your Gravatar, along with other public profile information, will display with the comments and “Likes” that you make on other users’ websites while logged in to your WordPress.com account. Your Gravatar + public profile information may also display with your comments, “Likes,” and other interactions on websites that use our Gravatar service, if the email address associated with your account with us is the same as the email address that you use on the other website. Currently, Lifeholistically does not allow commenting on posts, so this above statement is currently (as of May 24, 2018) not relevant. If you have signed up to received newsletters, sales, or basic emails from Ronda Arndorfer, we hold on to your name (if provided) and email address. We will do so until you have decided to no longer receive these types of notifications and hit unsubscribe at the bottom of one of the said pieces of communication. Opt-Out of Electronic Communications: You may opt out of receiving promotional messages from us. Just follow the instructions in those messages. Set Your Browser to Reject Cookies: You can usually choose to set your browser to remove or reject browser cookies before using our website, the drawback to this is that certain features may not be available to you. Close Your Account: While we’d be very sad to see you go, if you no longer want to use our Services you may hit unsubscribe at any time and your information will be deleted within 30 days. How is Stress Really Affecting your Health? 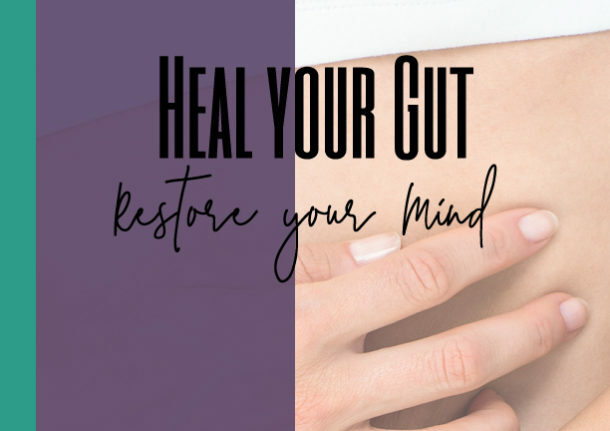 The state of your overall mental wellness is directly affected by the health of your gut. Grab this FREE guide to help get you started towards improving your gut health today. Congratulations, I know you will be more zen in no time! Join my mailing list to receive the latest news and updates from our team. I hate spam too and promise to keep your email safe.